Question: How Can I Remove Brown Stains from Stainless Steel? We used a product to clean out our new stainless steel sink. We were trying to do too much at one time spraying the product on the sink and forgot about it. Later we were getting ready to leave the office and saw these brown stains all over the sink. I tried to clean it off, but there are still several spots that seem to be stained. Do you know of any product that could help remove these stains? Answer: Many people are surprised to find that stainless steel can be stained. 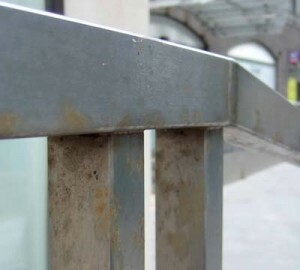 Cleaning stainless steel can sometimes seem tricky, but is a very resilient surface. When problems happen, it is best to start with the basics to help repair the surfaces. Baking soda mixed with liquid dish soap can make a good paste to gently rub on stains. Be sure to rinse the stainless steel surface thoroughly, and towel dry. If the stains still remain you can try vinegar. Remember to thoroughly rinse and towel dry. This entry was posted in Green Clean. Bookmark the permalink.